Using kids' love of rhyme to calm even the fussiest fusser. Spider spinning, spinning, spinning Spider spinning Spinning a web... [caption id="attachment_566" align="alignleft" width="336" caption="Spider Spinning"] [/caption] At first glance, this photo caused me to THINK and then jot those few words. So, what words might such a photo cause you or your child to THINK and speak? And...what does this spider busily spinning a web have to do with our Funday Monday and Parenting 4 Literacy? Well, what if... What if... What if this spider were the real thing? You know...the Eensy Weensy Spider? And what if that eensy weensy spider were traveling up your wall right now? 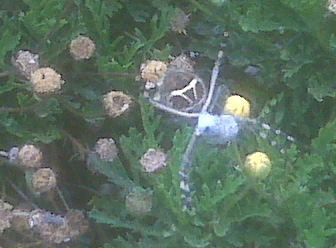 Or what if you were seeing this spider in your flower bed right now? Right there. Right now. No, you wouldn't be thinking of how to remove that little spider. Or how to avoid getting caught up in its web. No, No. Not at all. Your very first thought would be around how this little spider's presence provides you with a great opportunity to have a Funday Monday (or any day!) with your child. Right? Right! WOW! Yes, if your child is an infant or as old as age 6, that spider right there by you is gonna be the catalyst that gets you to say or sing and dramatize "Eensy Weensy Spider"... The eensy weensy spider went up the water spout. Down came the rain and washed the spider out. Out came the sun and dried up all the rain. Now the eensy weensy spider goes up the spout again. (Note: Variations of all sorts exist for this rhyme, including one on its title as "Itsy Bitsy Spider." You can even find the tune to this rhyme on the Web if it's not already in your personal repertoire.) But, what if your child is a bit older than 6 or 7? Well, you'll still sing and dramatize this little song. Know why? Because whether you sing or say the words, your breaking into this little rhyme or song upon the sighting of a spider will grab your child's attention! WOW! And that's our topic for this Funday Monday: How to grab and hold onto your child's attention with nothing but words you speak! Look at this power you hold...the use of fun words to not only grab your child's attention; but also engage your child's imagination. And when fun words grab your child's ears, the mind opens right up to all those morsels of knowledge that are embedded in every word. WOW! Now, suppose you have a fussy youngster in tow today. How might you still have a Funday Monday? Well, there's nothing b etter than fun language to divert your fussy child's attention. I promise you it works every time! Begin saying or singing a fun little ditty like this spider rhyme. Then just keep on keepin' on till those fussy fusses are all fussed away! WOW! Tomorrow, on TALKing Tuesday, we'll expand on this idea with yet another way to call upon fun language to be teaching your young (or not so young) child...while even you are having fun! Then on Wacky Wednesday this week, we'll do more "what if..." thinking about spiders! Go have a Funday Monday...with or without the help of a spider!